Unload everything you used or stored on the boat during the summer. Inspect life jackets and throwable cushions. If they are clean and have a clear, legible United States Coast Guard label, store them on a shelf in your garage or basement. Check on them a couple of times during the winter. Mice think life jackets and throwables make wonderful homes. Don’t wrap them in plastic. Let them breathe and dry out. Uncoil your dock lines and fenders, and then rinse, dry and store them in the garage or basement. Bring your first-aid kit in the house. During the winter, open it, inspect the contents, and replace all medicines and dressing materials that may have dried out or gotten wet. 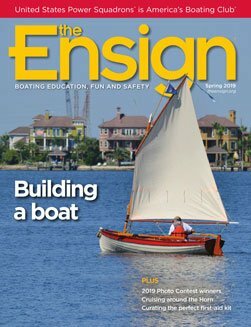 If your boat has portable gas tanks, disconnect them. Start your engine, and run the lines dry. As the engine sputters out of fuel, spray a lubricating fog into the carburetor and let the engine stall. If your tank is fixed, simply fog the engine until it stalls. If you haven’t done this all along, put the proper amount of marine gasoline stabilizer in your gas tank and stir it into the gas. Take the cowling off the engine. Spray a water-displacing rust preventative such as Boeshield T-9 or WD-40 over the entire engine. Replace the cowling. Once your boat is where it will remain all winter, tilt the engine down. Rain and snow can get into the through-prop exhaust and refreeze, damaging prop hubs and other lower unit elements when left tilted up. Remove batteries that can be easily removed, charge them fully outdoors and store them in the garage. If you believe placing batteries on bare concrete will somehow mysteriously discharge them, set them up on a board. Charge batteries you can’t easily remove and turn the battery switch to the “off” position. In all cases, check your batteries throughout the winter to make sure they have not discharged. Wash the boat and make sure you have drained those easily-forgettable things, such as your live well, live well pump and raw-water wash-down pump. Cover the boat. If you haven’t got a cover, I recommend an inexpensive blue tarp, not the green, silver or camouflage ones. I have tried every color, and only the blue ones last all winter. They may get porous come spring, but the others disintegrate by January. Hook up the trailer, and make sure the lights work properly. Repair any that don’t work. Clean and spray the connector plug with the water-displacing compound you used on your engine. Make sure the plug hangs facing down so water will run out and off. Put a small amount of axle grease on a piece of paper towel or a rag, and wipe the inside of the ball receiver to keep it from rusting. Make sure the trailer jack is well lubricated and secure. Jack up the trailer so the tires don’t touch the ground. Support the trailer with jack stands. Never get under a trailer supported in this way. Spin the tires by hand. Listen for crunching sounds. The tires should spin quietly and true. If you hear a noise or the wheel is difficult to spin, the bearings may be bad and need replacement. It’s better to replace them now than by the side of the road. If you have spring-loaded bearing caps, make sure they are properly filled and covered with a little vinyl cap. Check the date on the tire or the date you purchased the tire. If the age is around four years, consider replacement. It’s dangerous to get a blowout on the road and have to mount a spare at roadside. Don’t forget to check and replace your spare tire as well. Wipe down the tires with tire gloss or tire shine to prevent them from drying out. Cover each tire with a blue tarp. One tool store chain usually offers a coupon for a free small tarp. If you don’t have one nearby, purchase three small tarps elsewhere. They’re inexpensive compared to the cost of a trailer tire or what could happen in the event of a blowout on the highway. 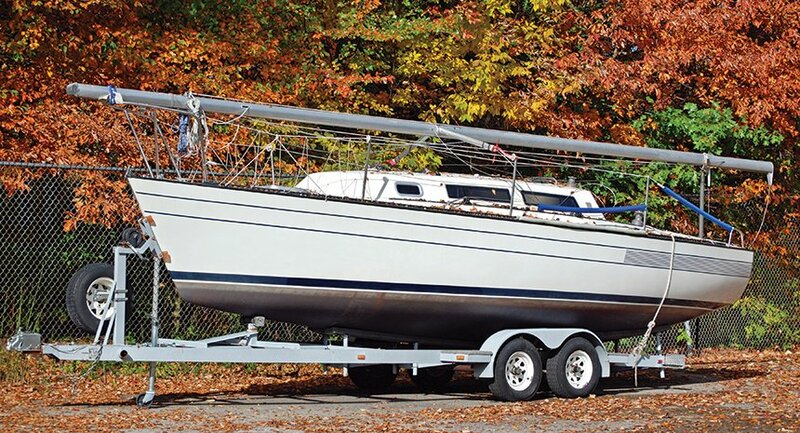 With the boat and trailer safely stowed, you can relax, comfortable in the knowledge that you won’t be the one everyone wishes bad things on when you take Leakin’ Lucretia to the ramp next spring. D/Lt/C David H. Osmolski, SN, of Charlotte Power Squadron/27, has been repairing boats since high school when his first boat, a canvas-covered canoe with cedar ribs, leaked in gallons per minute and required constant repair.